It is of course always heart warming to see people any where in the world overcoming despotic regimes. As the Iranian historian Kasravi said 'Nothing is as rapturous as when the people win their freedom'. 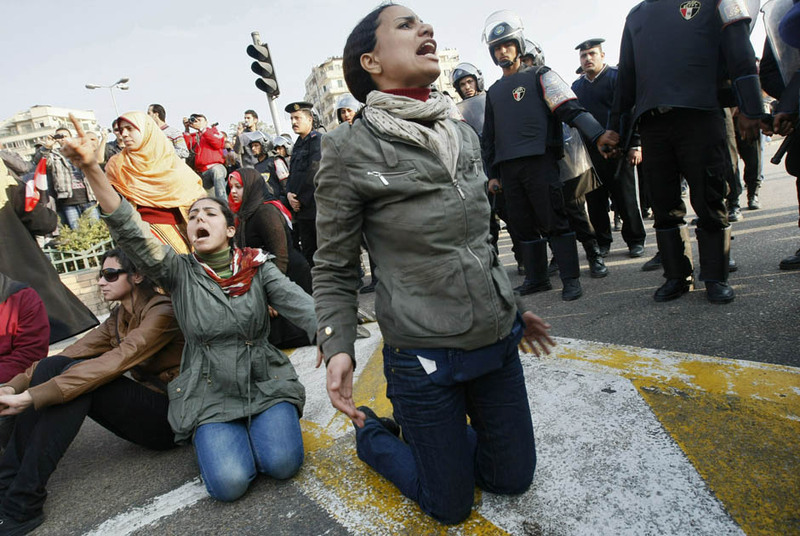 The recent events in Tunisia and in Egypt, the people power challenging a despotic regime, had many similarities with the events in Iran last year, but there are stark differences which may explain why it seems the concessions won in Tunisia and Egypt have been gained so much quicker. Watching the pictures from Tunisia and Egypt, it looks the crowd sizes in Iran were much larger. None of the protests in Egypt or Tunisia came any where near the three million crowd who came to the streets in Tehran, six days after the fraudulent elections in June last year. The repression by the regime in Iran was many times more brutal and savage than that in Tunisia or Egypt however. People in Egypt and Tunisia were not attacked in their homes and pulled from their roof tops for simply chanting Allah Akbar at night. The injured protesters in Tunisia and Egypt were not attacked in hospitals and dragged from their hospital beds. Protesters were not arrested and bused into detention centres like Kahrizak and raped in Tunisia and Egypt like they were in Iran. The Iranian regime is one that seized power through a revolution and is thus well experienced in how to avert a revolution. As a friend of mine in Iran quoted his revolutionary guards commander "we will do everything the Shah didn't do and not do any thing that the Shah did during the 1979 revolution. Just one concession will open the floodgates and increase people's confidence in overthrowing the regime, we will not give one concession to the protesters"
Foreign journalists were not kicked out in Egypt and Tunisia as they were in Iran quickly after the protests erupted. When Iranian protesters used social networking tools like Facebook and twitter and citizen journalists uploaded their mobile phone pictures and videos, the Iranian protesters were quickly labeled by rich Western Left-wing intellectuals as "affluent North Tehran kids" who did not represent the country. In Tunisia, Trade Unions with several thousand members existed and could be used to organise the protests. In Iran, the smallest gathering and organisation which is not sanctioned and controlled by the official channels is impossible to survive. Obama and other Western leaders were quick to condemn violence in Egypt and Tunisia, yet when it came to Iran, they dithered and fretted in case their condemnation of killings was interpreted by the Iranian regime as Western interference! Overthrow of any fierce dictatorship needs the broadest possible coalition, but many Iranian expats did all they could to undermine such coalition and propagate divisions. Watching all this perhaps nothing was more annoying than the filthy Press TV hypocrite, Yvonne Ridley claim "What the Egyptian people are doing is so courageous because what they are facing, as we can see on our screens, is this terrible machine which seeks to instil fear and brutalises the people." Yvonne Ridley of course ignores the courageous people who rose up against the terrible state terror machine of her pay masters in Iran. Stop the War Coalition who through out the protests in Iran refused to express any solidarity with the Iranian protesters by using the excuse that "we are only concerned with war situations" did not lose any time to express solidarity with the people of Egypt. Next Wednesday, they will hold a public meeting in Conway Hall in solidarity with the Egyptian uprising, with speakers like George Galloway and John Rees, God help the Egyptian people from such solidarity expressions! As Mark Urban said on BBC tonight, "all such revolutions are of epic importance and consequences, the outcome however is uncertain and any extremist violent minority group could seize power as they did in Iran in 1979 and in Russia in 1917"
The Tunisian police or Egyptian police have not gone to the homes of dissidents in dead of the night to arrest them. The Iranian regime is far more brutal and deadlier than any totalitarian state (minus N. Korea, maybe). Many organizations and individuals have announced their serious concern about public executions and intensification of executions in Iran. Saturday 29th January 2011, has been declared as a day of global protest against executions and in defense of political prisoners in Iran. If makes for depressing reading, if Iranian's can't replicate the 'People Power' protests currently sweeping across Arab regimes. However, like you said Potkin. Millions turned out to protest the rigged elections of Iran as opposed to the ten's of thousands currently effecting change in Arab countries. So take cheer. The bigger the oppressive crimes, the greater the numbers will eventually turn out against it! It's been said time and time again with these Arab protests. 'All walks of life.' 'Risking their lives.' 'Breaking the fear barrier.' Ultimately all it takes is a massive courageous swell of numbers - mothers, wives, children, the youth to say enough is enough by coming out onto the streets in high numbers. ...Long enough - Sustained enough - Big enough, ultimately it will all boil down to the Basiji doing a runner and the Revolutionary Guard having a severe clash of conscience if asked to open fire on their own unarmed citizens. In such situations, most military leaders finally admit that who they work for are wrong and change sides to help the people. Personally I refuse to believe that the events going on in the Arab world, won't also raise the copurageous bar for those Iranian's who will finally dare to take on such a murdering oppressing monstrous regime! IT CAN BE DONE. But only of course if enough people brave the storm to finally be rid of the black clouds over them! As you say, Potkin, the difference in numbers is striking: a full order of magnitude (tens of thousands in Egypt, who are VERY provocative, vs. millions in Iran, who only responded after attack -- AND NO LOOTING IN IRAN). This video from June 2009 makes it clear: the regime attacks; the peaceful demonstrators protect themselves and then prevent a policeman from receiving justified punishment. So Obama presented Ahmadinejad/Khamenei as the embodiment of Western-induced suffering. In fact in 1979 the West helped put the Islamists in power. And indeed, according to the New York Times, the CIA considered putting them in power during the 1953 overthrow of Mossaddegh, if the Shah was too squeamish to take over. Obama’s statements in June 2009 were a direct message to Americans: don’t protest about the situation in Iran, we have no right. "And when you've got 100,000 [!!] people who are out on the streets peacefully protesting, and they're having to be scattered through violence and gunshots, what that tells me is the Iranian people are not convinced of the legitimacy of the election. And my hope is that the regime responds not with violence, but with a recognition that the universal principles of peaceful expression and democracy are ones that should be affirmed. Am I optimistic that that will happen? You know, I take a wait-and-see approach. Either way, it's important for the United States to engage in the tough diplomacy around those permanent security concerns that we have – nuclear weapons, funding of terrorism. That's not going to go away, and I think it's important for us to make sure that we've reached out." An IR-friendly government of ElBaradei, with the Muslim Brethren looming or directly involved, would be no better and probably worse for Egyptian working people, and definitely much, much worse for the world. One step closer to a new dark ages. I think you meant "sieze power" when you wrote "cease power" (don't want to nit-pick, but they mean the opposite, so it is important to get the meaning right!) Maybe you might wish to edit your blog if you want to correct it? "World powers have determined that enemy number one for their superiority, is blooming of nationalism among the poor nations that have natural resources or are proxy to other countries with natural resources. Such nationalism has to be squashed every 1-2 or 3 decades and a fanatic system of corrupt government to be installed to automatically push such nations to dark ages and hence maintain the pipeline of natural resources to the superpower and its allies. We have determined and reached the conclusion that the best system of governance for such nations is an Islamic form of government. Iran's experiment has taught us that lesson. While theocracy is the worst form of government for the aborigines in short and long run, yet for the superpower it's the least cost intensive form of manipulation of another nation, in order to maintain the New Word Order. One nation under many flags, so help them God." BBC Persian Does it Again! So what Happened with Stuxnet?